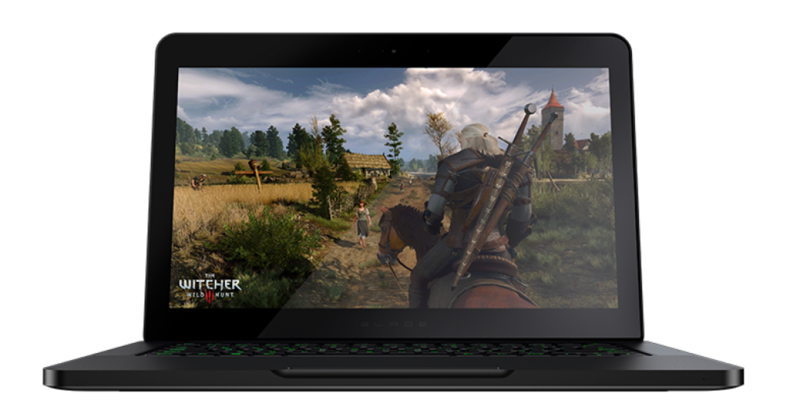 The Razer Blade Signature Edition Gaming Laptop aims to offer high-end gaming and portability. If you are looking for a gaming computer, you generally have to look at desktop machines. Laptops are designed for powerful gaming and often include integrated graphics that are not capable of playing the latest generation of video games. The Razer Blade Signature Edition is one of the few exceptions to this rule. 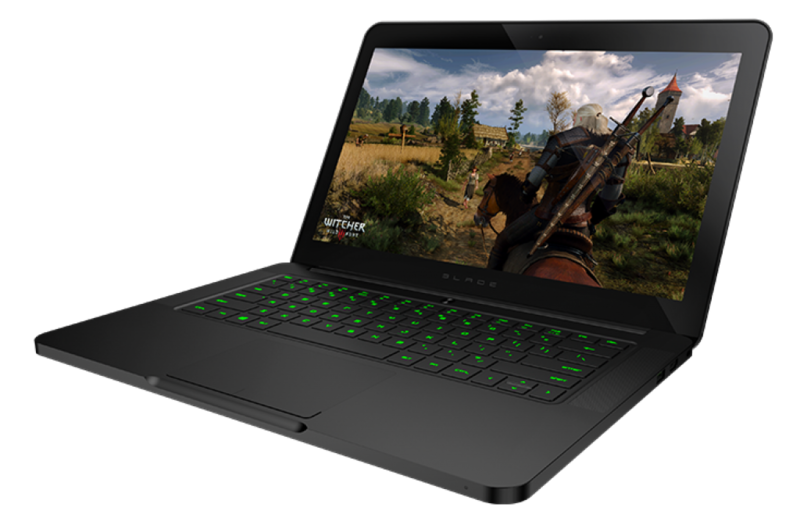 It features a powerful NVIDIA graphics card, an Intel Core i7 processor, 16GB of ram. Take a look at the rest of this review to find out of the Razer Blade will meet your gaming needs. Better than expected. Way better than the 2014. That covers some of the basics of the machine. The Razer Blade Signature Edition is designed for gamers with a number of features that should help ensure you can play any game available without any problems. The first feature to stand out is the amazing display. The 14-inch screen has 3200×1800 HD resolution. It also features touchscreen capability. Though, the touchscreen is not a major attraction. The clear display looks great, especially when paired with the NVIDIA graphic card and the wide viewing angle. The NVIDIA GTX970M is a nice addition. This should be sufficient to handle the most popular video games on the market. The GTX970M surpasses the graphics currently used in the latest gaming consoles. Razer is primarily a manufacturer of high-quality gaming keyboard and mice. So, it is no surprise that the Razer Blade Signature Edition includes a great gaming keyboard. This keyboard includes backlit lighting for gaming in the dark and also allows you to remap keys. Create macros and different setups for each of your favorite games. The Razer Blade Signature Editions has a relatively short battery life. Despite the claims of 7 hours or longer, the battery life is closer to 5 hours. Though, this depends on what you are doing with your machine. If you are playing a graphics-intensive game, then you can expect the battery to drain even quicker. The battery life is not a major issue and is partially expected for such a powerful machine. It takes quite a bit of power to handle the Intel processor and NVIDIA graphics card. The next item is just a cosmetic issue and does not actually affect performance. There is a wide bezel around the display. If you are used to using a machine with a narrow bevel around the screen, this can be distracting. Though, you will eventually get used to it. It does not change the fact that the screen is 14-inches. The other issue is the heat dissipation. The machine gets hot quickly. Again, this is to be expected, when you are running a high-end graphics card and a powerful processor. Razer did their best to help heat escape, but it can still get too hot for your lap. Razer used touch point thermal engineering to help direct heat away from the main touch surfaces. The areas that are not commonly touched are the areas where heat is directed. This does help with heat dissipation. Though, if you are playing a video game for more than a few minutes, you will want to set your laptop on a desk or table. A short battery life, a hot laptop, and a wide bevel are only minor issues. This is especially true when you consider the power that is thrown inside the Razer Blade. The Razer Blade is a durable device. It has a stylish case made from aluminum with a matte black finish. The machine is relatively heavy. You will probably spend most of your time using this laptop while it is set on a desk or table. Between the heat and the weight, setting in your lap for an extended period of time can become uncomfortable. The backlit keyboard and the backlit logo on the back are a nice complement to the matte black finish. Razer even added green to the USB ports, which was a nice little touch. Despite all of the power inside this laptop, Razer has managed to keep the thickness to just 0.7-inches. That is remarkably slim for this device. The Razer Blade Signature Edition is powered by an Intel Core i7 quad-core processor. The 2.6GHz of processing power includes hyper-threading technology to create 8 virtual cores to improve your gaming experience. With Turbo Boost, you can reach processing speeds of up to 3.6GHz. For memory, the Razer Blade has 16GB of 1600 MHz DDR3L memory. Most of the top games on the market only require 4 to 8GB of ram, with some games having a recommendation of 16GB. You should not have to worry about upgrading your RAM anytime soon. Along with a great processor and plenty of RAM, the Razer Blade has a 512GB solid state drive. An increasing number of laptops are getting sold with solid state drives. This helps to cut down on power, heat, and noise. It also boosts load time. Windows 10 should load in seconds and your games should launch much faster. 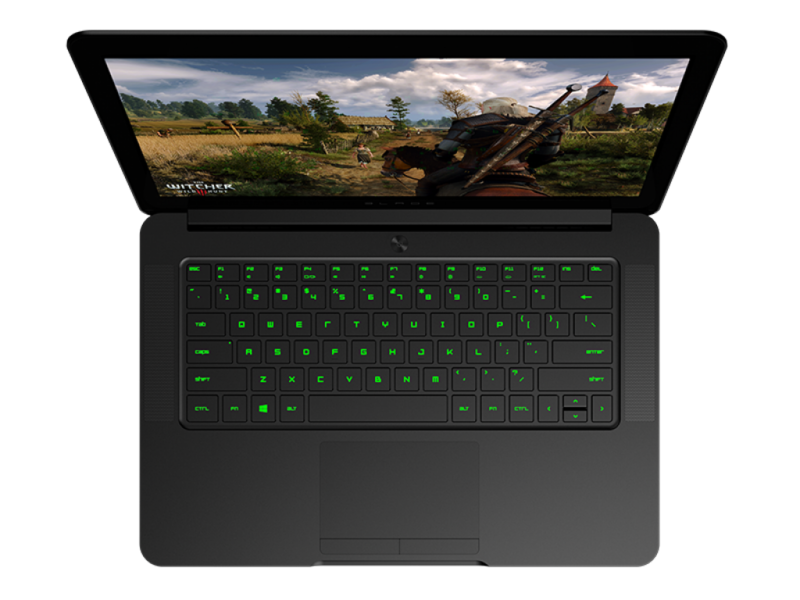 As mentioned, the Razer Blade has a 14-inch display with a resolution of 3200×1800. The QHD+ display with touchscreen looks breathtakingly clear. It has amazing clarity, sharpness, and color intensity. The touchscreen is a nice addition, which allows you to take advantage of the latest Windows 10 features. 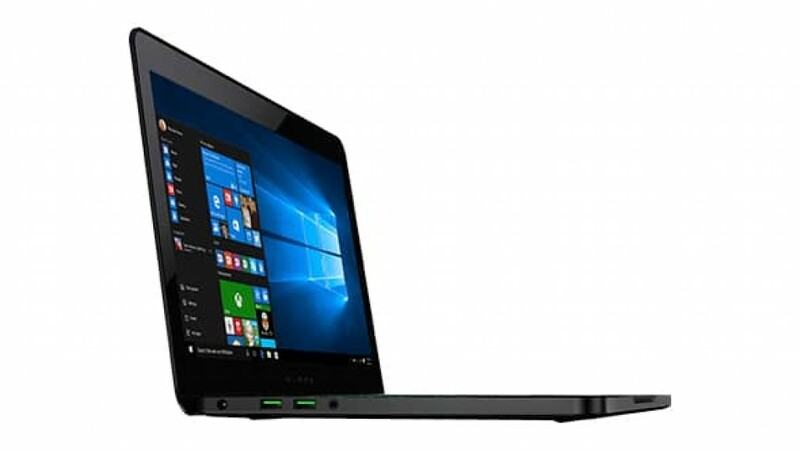 While this is primarily a gaming laptop, the touchscreen provides added functionality for multitasking when performing general tasks, such as browsing the web and using multiple applications. The display also uses IGZO Technology. This stands for Indium Gallium Zinc Oxide. IGZO provides faster refresh rates and propagation time. This prevents ghosting and results in a smooth video and frame rate when playing the most demanding of video games. The benefits of the display do not stop yet. You also get a wide viewing angle. While you will likely be sitting right in front of the laptop when playing a game, the wider viewing screen prevents color changes when you lean too far in any direction. It also has a 350-nit brightness rating from the LED backlight. This helps when playing games in midday with a moderate amount of sunlight. At night, the screen jumps out at you. One of the best features of the Razer Blade Signature Edition is the graphics card. While this eats up some of the power and results in a shorter battery life, that is the trade-off that you need to deal with when buying a high-end gaming machine like the Razer Blade. The NVIDIA GeForce GTX 970M Graphics Card has 3GB of GDDR5 VRAM. This is the latest and greatest in gaming. You get super-fast performance with advanced graphics technology. As discussed above, the gaming keyboard is another one of the primary advantages of this device. Razer is known for making quality gaming mice and keyboards. Remap keys and set macros for your games. This is incredibly useful when playing action games and RPG’s. You also get 3 USB 3.0 ports, an HDMI output, Bluetooth connectivity, 802.11AC Wi-Fi, but no media card reader or Ethernet LAN port. The lack of a media card reader is a little strange, as is the removal of an Ethernet connection. 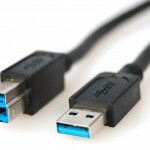 While everything is becoming wireless, it always nice to have the option connecting an Ethernet cord in the event that you are having trouble with your Wi-Fi. Not having a media card reader is not a major problem, as you can find USB card readers for a few dollars. The Razer Blade Signature Edition comes loaded with Windows 10. 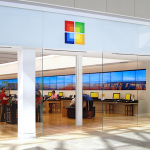 If you are not familiar with Signature Edition computers from Microsoft, the name is used for products that are released without a bunch of bloatware, trial software, and other junkware. You get Windows 10 and the very minimal set of software, so that you can customize your laptop however you want. Razer includes a limited warranty for 1-year. This covers any defects in manufacturing. 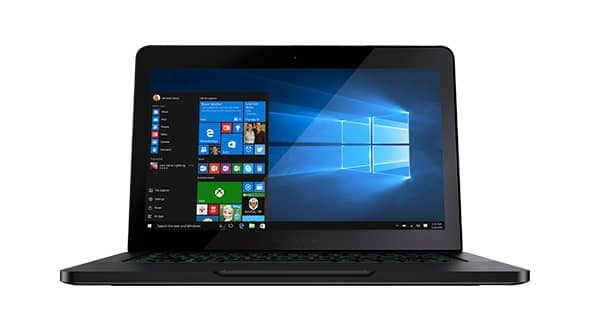 If you are concerned about what this warranty may or may not cover, you should consider purchasing an extended warranty from the retailer or online store that you purchase the Razer Blade from. The Razer Blade Signature Edition is a quality laptop. 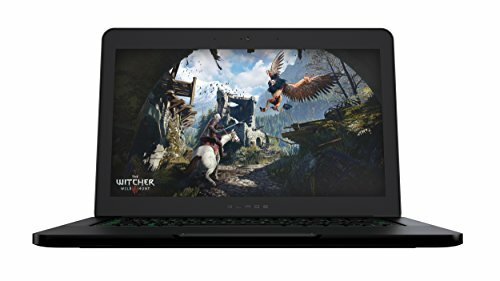 It is probably one of the few laptops that are able to play the latest graphics-intensive video games right out of the box. The 3GB NVIDIA GTX 970M graphics card, 16GB of memory, and Intel Core i7 processor surpasses even some of the latest desktop computers designed for gaming. If you take your gaming seriously, but what the option of having a portable device, this could be the perfect solution. There is really nothing not to like about the Razer Blade. The only complaints related to performance have to do with the battery life and the heat dissipation. The battery drains quickly and the laptop heats up quickly. Both of these issues are directly related to the power packed into the thin laptop frame. You would typically place this much power in a desktop case with a bunch of fans. Therefore, a drain on battery life and a hot laptop are to be expected. In the end, you will not find a more powerful gaming laptop in this price range. It is powerful enough that you should have to worry about upgrading the memory any time soon. When you buy a new laptop or PC, you do not want to have to upgrade for at least a couple of years. Razer claims that this is the thinnest, lightest, and most powerful 14-inch gaming laptop in the world. They are probably right. For those that love to play video games, you should definitely place this at the top of your list for potential buys.